Ah, the delicious chocolate mousse…oh, no, sorry. Ah, Dear Reader, we’re onto the second teff recipe, for the future Dear Readers the first was here, and it’s not the most exciting of recipes. I use waffles like these as a quick bread, they’re extremely basic, probably a far cry from your more conventional waffles, not that I’d now anything about them as I never ate them when I could, I’ve missed out on a lot, Dear Reader. Still, I have a lot yet to try, these are one of the handiest recipes I have, I usually fill them like a sandwich. Today I used chicken seasoned with my neglected Nightshade Free Taco Seasoning, I can’t remember if I’d gone off nightshades before I started on the blog, but, well, I was a fiend for chillies and anything spicy, it taught me a lot, the most important was of course that I couldn’t eat anything like that. Such is my journey, Dear Reader, but today let’s talk teff. Now, I knew if the bread worked this would, the only times I’ve had waffles fail was with Amaranth Flour because it just creates sticky messes unless blended with another flour, the joys of free-from baking discoveries are endless, Dear Reader. The only question here was texture, sometimes you don’t get the texture you’d expect, with quinoa flour I’d hoped it’d achieve a crust like the bread, but sadly no, it cooks too fast for that. Teff here actually stands out in a special way, it still has that more moist texture, better than buckwheat and much better than rice flour in that regard, but what really shines is that nutty taste. Even with spiced meat and cheese it still stood out to my, well honestly damaged, taste-buds, have to be blunt at times, Dear Reader, there are times I can’t even taste. What exactly it reminds me of is still eluding me, it has a lightly roasted nut taste, really pleasant. I’m thinking if it’s still available when my rice flour runs out I may replace it with teff. So, you basically get a firm, spongy waffle, a subtle nutty taste and a deceptive colour and all in a matter of minutes. Teff has been intriguing so far, usually taste is the least promising and sometimes least pleasing aspect of free-from flours, amaranth and quinoa both can be bitter and earthy, buckwheat is strong tasting, though I’m used to it now and love it, but teff stands out for that. It also retains moisture well. That’s two checks in its favour, next I’ll have to use recipes that test its strength and stability. All things in time, Dear Reader, take care. They really do resemble something made of chocolate. 1. Turn on Waffle Iron. Beat the Egg, Olive Oil and Salt until combined, then beat in Flour and Baking Powder. 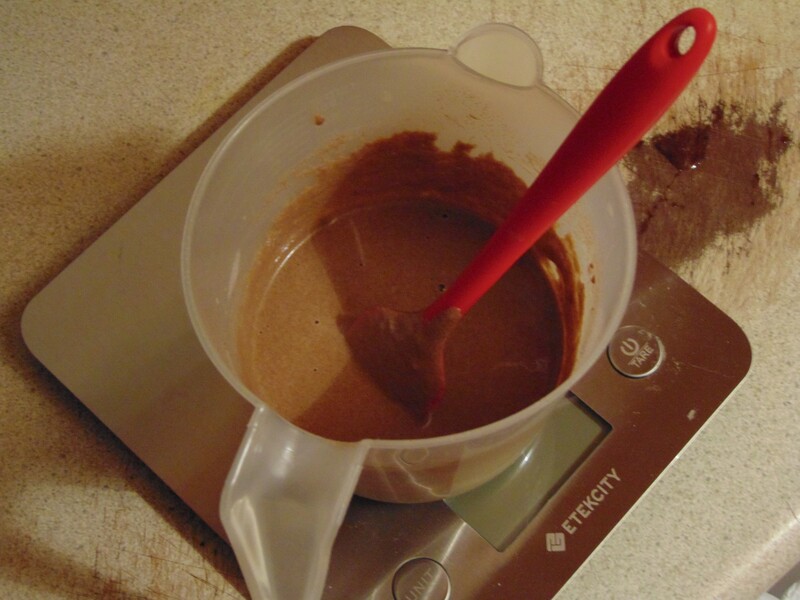 Finally add water, gradually, until a stirrable, but still thick batter has formed. 3. Add enough Batter to warmed Waffle Iron to fill the plates, close and cook for 7-10 minutes until waffles are chocolate brown, dry and firm. 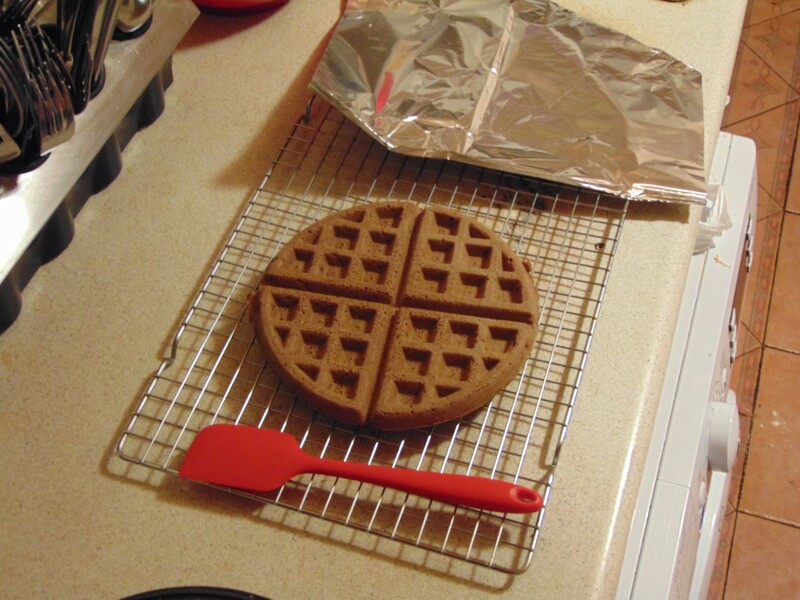 Remove with a rubber spatula and let cool for a few minutes, Waffles will crisp up further as they cool. I am so sorry I got rid of my waffle maker years ago, at the beginning of my own free-from journey, assuming I would have to forgo such items! Not planning to buy a new one just yet. Back in the fall I invested in a « Chufamix » milk maker, not electric yet quite expensive — well, made in Europe, you know. I should have made that purchase long ago, it made total sense for us but I was afraid (Fear, Fear, how you plague us free-from pilgrims!) the milk would not taste right. I calculated it should be amortized by the time spring comes. Anyway, back on the waffle iron bit, I can always borrow someone else’s. And of course I will let you know how we liked the waffles. Thank you for the recipe! I’ve found it extremely useful, I never buy an expensive iron, just whatever happens to be cheapest as I find the plates do tend to lose their non-stick quality overtime. Sometimes I think you’re better to buy cheap and replace than to buy expensive and rue the day it breaks. You’re very welcome, there are more to come and failed tests to discuss. All things in time.